Leo’s students, Mike, Raph and Mez face the horde of zombies – Raph pulls out Don’s futuristic staff and uses it to electrocute the monsters. Meanwhile, Leonardo is almost overcome by the brains when Donatello returns and blasts them off his brother. Don explains that he used the exo-skeleton’s ability to heat-up to burn the brains off of him and escape. Back inside the warehouse, Raph fries all of the remaining zombies with a mega-dose of electricty – which causes the staff to overheat and blast a hole into a nearby wall. Thousands of gallons of liquid pour into the room, along with brains and… Leo and Don! Just then, Craniac and Verminator X arrive and start shooting our heroes with laser blasters. Mike throws his chuks at Craniac, hitting the fiend in the face and causing him to fire his weapon into the ceiling, which collapses onto the villains. 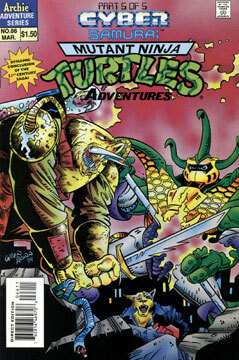 Craniac flips out and prepares to “carve the brains” out of the Turtles, but Verminator X turns his gun on his partner and states that they agreed to take no brains from living beings. Bemused, Crainiac announces that they’ll all die when the asteroid hits the planet and escapes in his ship. The TMNT are shocked to hear about an asteroid on a collision course for Earth! Verminator X laments forming a partnership with someone who “looks like a pig” as Raph grabs a pistol and points it at the catman. The two stand face to face, guns pointed at one another. Verminator X dares Raphael to shoot him – so the turtle does! Leo is furious at Raphael for using a gun, something Splinter had always taught them to avoid. Raph states that he’ll deal with the consequences by himself… for the rest of his life… which will only last until the comet hits. Cut to a scene in outer space, a ship is closing with the asteroid and fires a missile into it, blasting it to bits. As the camera pans out, we see that the pilots of the craft are none other than Donatello and Verminator X – now returned to his former persona of Manx. Donatello was able to save his life and return him to his former, heroic self.